To read the life of Fr. 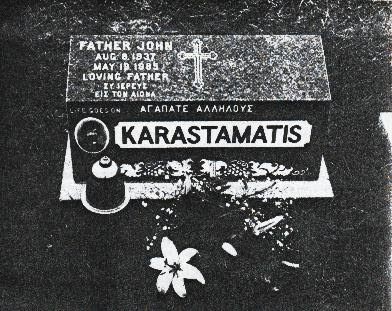 John Karastamatis (+ 1985), whose memory is celebrated on May 19th, read here and here. The following miracles were compiled by Claude Lopez, one of Father Dorotheos Themelis spiritual sons living in Switzerland. Concerning these, he writes: "All the miracles mentioned were either told by Fr. Dorotheos, who is a personal friend, or were written to me from Greece by spiritual children of Fr. Dorotheos; or, as in the case of the ones from Switzerland, they happened at our place in Geneva." St. John's mother is very old and does not know that her son died. She is often visited by a priest "who is very kind but won't accept to drink or eat with her." It is her son! One day at the Monastery of St. Nicholas on Andros, Fr. Dorotheos Themelis, Spiritual Father of St. John, was sitting and talking with four different people. Suddenly they saw St. John in the entrance door. Fr. Dorotheos, very moved, cried out to him, "Father John!" But he disappeared. A few minutes later, the postman came with two parcels: one contained the service to St. John in English and the second one an icon of the latter. Father Dorotheos, wishing to honor his spiritual son, ordered an icon to be made in Athens. The iconographer finished the icon and varnished it with a varnish that did not have a very pleasant scent. When he came back the next day, his workshop was filled with a very fine and subtle fragrance. He asked his brother whether he had burned any incense in the room. His brother replied to him that he did not have money to spend on such nonsense. (He obviously was not a very pious man.) The iconographer went closer to the icon and realized that the perfume was actually coming from the icon itself. This lasted a few days and disappeared. Mother K., superior of a small women's monastery in Athens, saw St. John in a dream. He told her that his icon should be spread in the world. She told the Saint's spiritual father and little reproductions were made and are now available. A.K., a young girl, had serious personal problems. 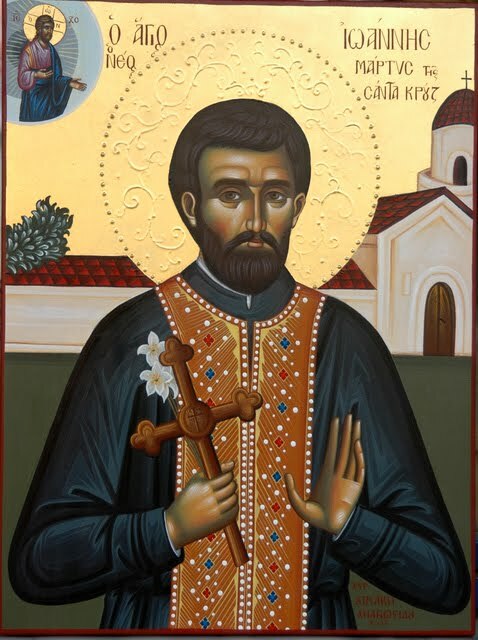 Through a friend of hers who knew Father Dorotheos on Andros, she phoned him and asked him to pray to the Saint (meaning St. John of Santa Cruz) in order that she might get help from him. He did so. When he finished praying, the phone rang: it was A.K. ; her problems were solved. The mother of the aforementioned girl saw St. John in a dream: light was coming from the Cross he was holding in his hand. Archimandrite Dorotheos Themelis and Fr. 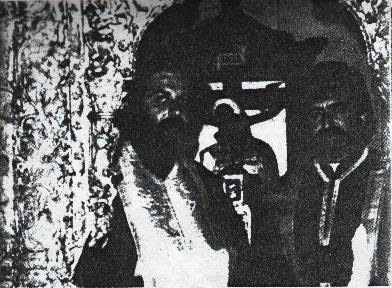 John Karastamatis in 1981, serving together in the church of the Monastery of St. Nicholas on Andros. Father Dorotheos is used to coming to Switzerland twice a year. 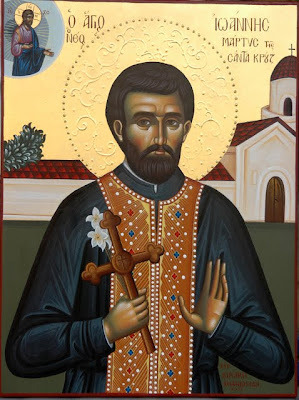 Some people knew about St. John (thanks to what was published in The Orthodox Word) but the presence of Father Dorotheos has permitted a better knowledge of the new martyr, and he has manifested himself several times in various places there. In a little village of the Canton de Vaud, a relic of the Holy New Martyr John - a fragment of his epitrachelion - started giving a very strong fragrance one night (October, 1986) at the home of a couple of Orthodox Christians, Claude and Dominique Lopez. This part of the Saint's epitrachelion is inside a box. Inside the lid of this box there is a carved wooden icon, and on the lid there is a painted one. The fragrance was a very strong one, a little like a lily. They waited until the next day before mentioning anything to anyone. The wife Dominique did not want this to be publicized. Claude had been asked by Father Dorotheos to write a life of the New Martyr and to mention some of the miracles that had already happened. The husband tried to argue that this grace of God was to be proclaimed, but he finally accepted his wife's position. During the night, the wife woke up because of the strong fragrance of lily which had come all the way from the icon corner to her bed. She could not sleep because of it and went to the icon corner. It was lit as if it were daytime. She prayed for a while and then went back to bed. On the next morning she told her husband that she agreed to have the wonder of the epitrachelion published. The Saint had convinced her. This epitrachelion has kept its perfume; at times, its fragrance fills the whole apartment. In February, 1989, the inside wooden icon started smelling, too, and tiny drops of myrrh appeared during three days and disappeared. Both the epitrachelion and the icon are still very fragrant to this day (19 October 1989). Cotton put in contact with the relic keeps this subtle fragrance in a very strange way. In the same place, one night Dominique had a dream. She saw herself and her husband in Greece, in a huge church where people were venerating the relics of a saint. Her husband had venerated the relics and told her: "There are three bones! Can't you see?" She could not see. She wiped the glass that covered the top of the reliquery, and she saw the face of a priest. The dream ended there. The next morning the postman came with a parcel from the United States. In it were several things concerning St. John and in an envelope a photograph of the tomb of Father John the New Martyr. On the tombstone there was a photograph in a medallion: Father John! This was the face Dominique recognized from her dream. In Geneva, Mrs. S.P., a pious Greek Orthodox woman, once called one of her Orthodox friends, asking for help. She had developed a growth - about the size of a pigeon egg - under one of her eyes; she could hardly see and could not wear her glasses. Her friend told her that she should pray to St. John. She went to the Saint's icon and she prayed thus: "My Saint John, please, pray to God for me; you notice how miserable I feel...." She kissed the icon and the relic of the epitrachelion that it contained, and she went to do her various duties. A few minutes later she happened to be in the washroom; she looked at herself in a mirror and was flabbergasted: the growth had disappeared! In Aigle, a young Orthodox lady A.M. had big problems: she was unemployed and could not get paid for what she had done previously. She had been fired by her employer after having been "badmouthed" by some of her colleagues. She prayed to St. John and very unexpectedly her boss met her, apologized and decided to grant her whatever she was trying to get through her lawyer. She also had problems with taxes which were solved very remarkably through St. John's intercessions. She is used to visiting friends who happen to have the fragrant relic of St. John's epitrachelion and the fragrant icon. She always brings flowers to them, for the icon of St. John. Source: The Orthodox Word, No. 1 (156), January-February, 1991.